Arthur Lismer (Canadian, 1885 – 1969), Untitled Forest Landscape, c. 1950, oil on board, Collection of the Toronto District School Board. Presented to Lawrence Park Collegiate by the Parents Association in appreciation of W.K. Bailey, principal 1957-64. 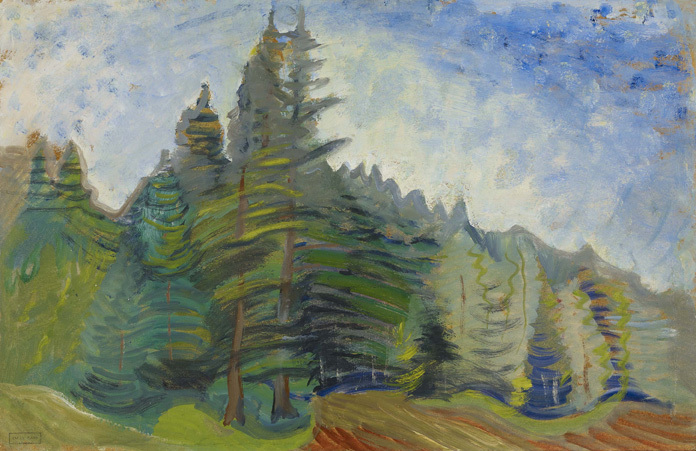 © 2012 Estate of Arthur Lismer. Arthur Lismer was born in the north of England in 1885. He showed artistic talent early on in his life, and became an engraver’s apprentice at age 13. 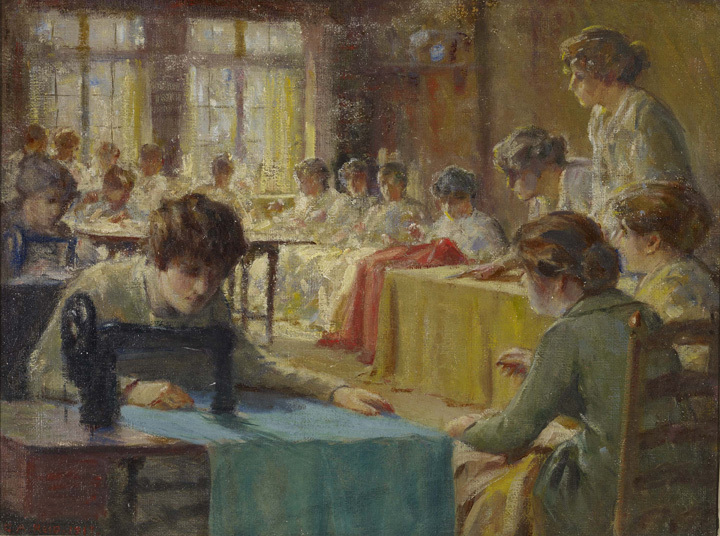 Lismer’s formal art education began at the Sheffield School of Arts in 1898. 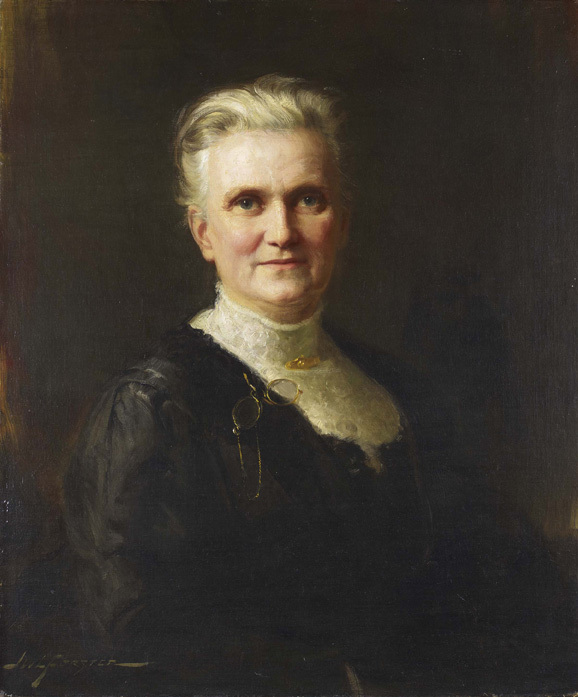 He studied there for seven years before moving to Belgium to complete his education at the Academie Royale. 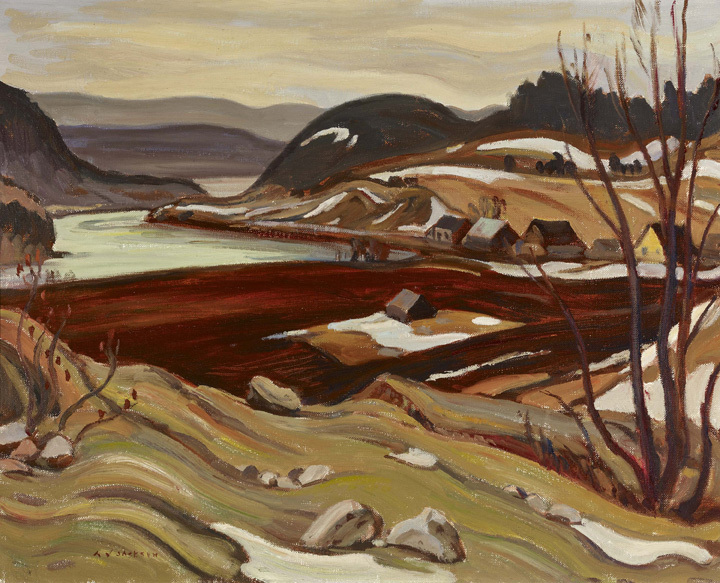 Lismer immigrated to Canada in 1911, and chose Toronto to begin his practice as a working artist. 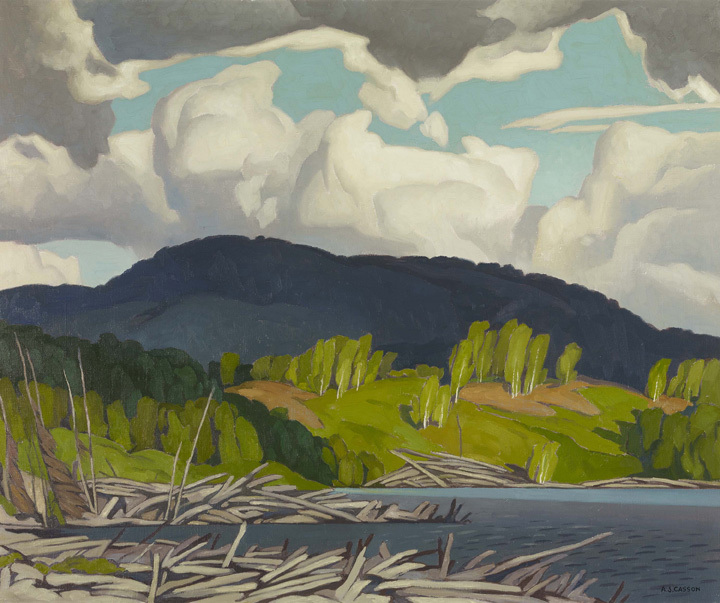 He joined Grip Limited, an illustration and graphic design firm, where he met several colleagues that would later become the Group of Seven, Canada’s most famous art collective. Although Lismer has secured his place in history as a celebrated artist, he was also a committed art educator. 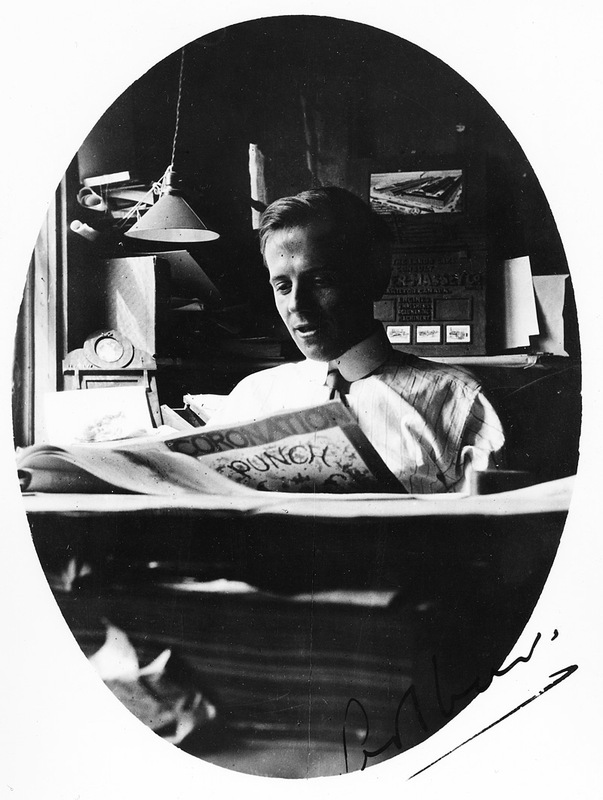 From 1927 to 1938, he designed and directed an ambitious art education program for the Art Gallery of Toronto, which would later become the Art Gallery of Ontario (AGO). Lismer believed that art and artmaking should support social needs, and become integrated into everyday life. …it is through the children that we wish for a new world, in which art and beauty may find a place in the common expression of living. The motivation of every class and program developed and begun was that children be taught to use their eyes, to see, and by seeing, to design a world everywhere beautiful. Lismer continued his commitment to art education in numerous institutions, including Columbia University, the Montreal Museum of Fine Arts, and several overseas galleries and art centres in South Africa, Italy, France, Australia and New Zealand. 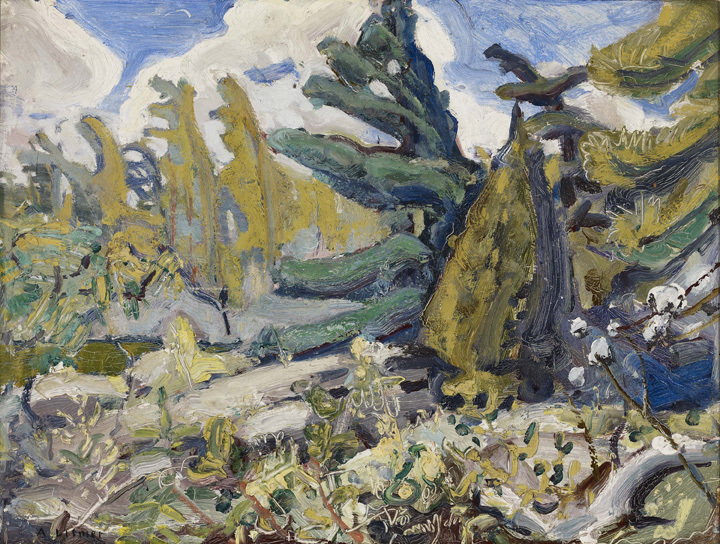 Lismer died in his mid 80’s and is buried in the small cemetery on the McMichael gallery grounds in Kleinberg, Ontario. 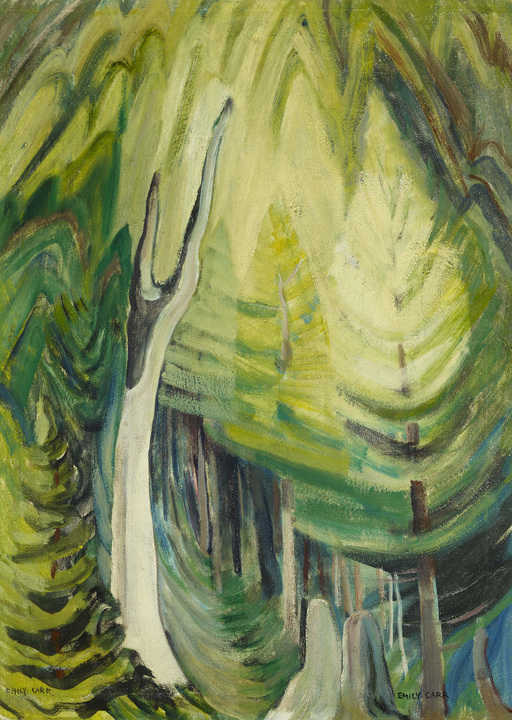 Lismer’s Untitled Forest Landscape was painted around 1950. Similar in scale to Tom Thomson’s oil on board sketch, this small modest painting was likely done in the wilderness, in preparation for a larger, more detailed landscape piece. Close inspection of the work reveals each individual brushstroke used to create the trees, bushes, rocks, and sky. Additional markings are scratched into the surface, likely by using the end of the brush to scrape away some of the paint, creating additional details. Standing closer to the painting reveals its abstract features, where as a viewing distance of two meters or more highlights its more realistic qualities. 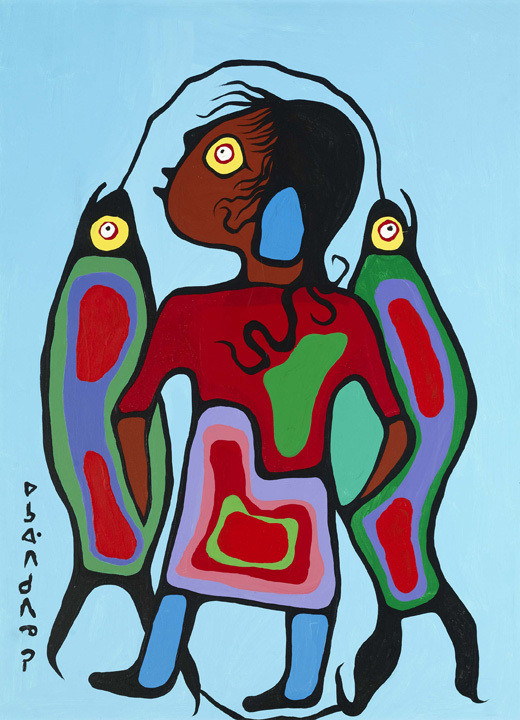 This painting is part of the Toronto District School Board collection. The Parents Association presented it to Lawrence Park Collegiate in appreciation of W.K. Bailey, the former principal. Canada has not the traditional pastoral quality of the older countries. It is rugged and stern over large areas, untamed – perhaps untamable. Its seasons are not the gentle, passive gliding of one into the other, they are distinctive and extreme in contrast…The aspects of winter and the fall; the green riot of spring, storm and sunshine, against and on such a setting, are truly of epic grandeur – no timid play of subtleties, but bold and massive design. Arthur Lismer lived and worked in Toronto for much of his career. Before becoming the head of the education department at the Art Gallery of Ontario, he was an instructor at the Ontario College of Art (now OCAD University). 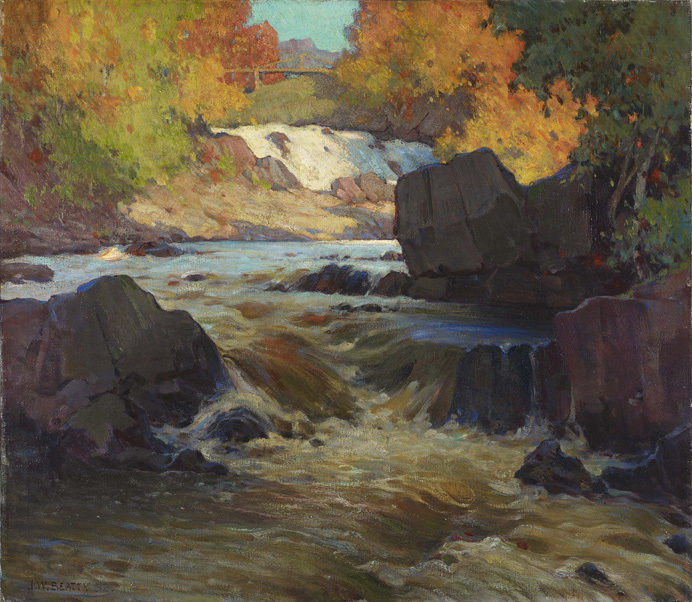 Lismer also frequented the Group of Seven Studio Building in Rosedale Valley, but never called it home. He lived on Delaware Ave. This was his first family home where his daughter Marjorie was born in 1913. Arthur Lismer is well known for his contribution to art education at the Art Gallery of Ontario. 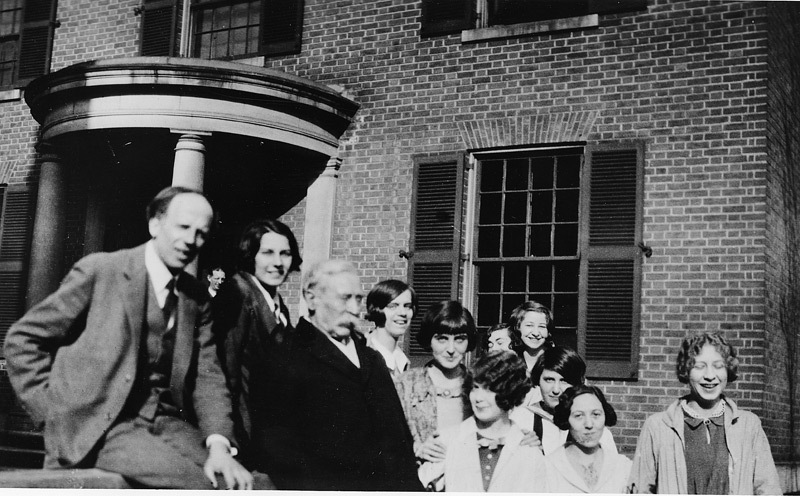 His fee Saturday art classes, which began in 1933 were attended by thousands of children each week. 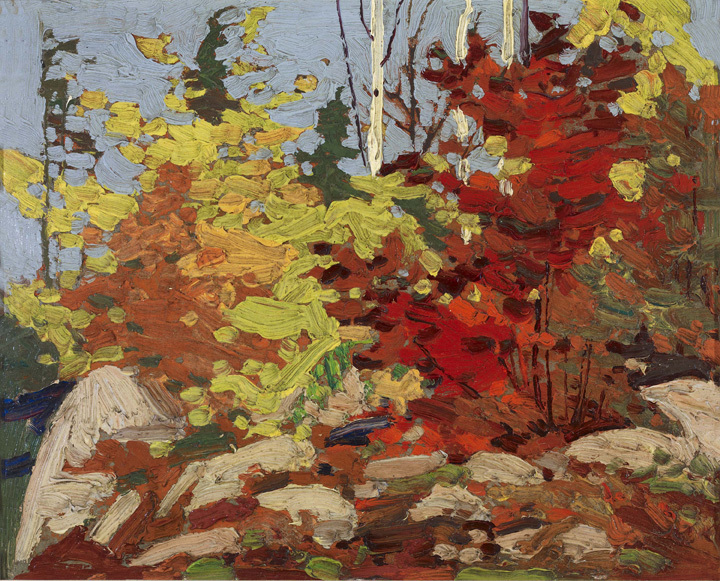 Lismer’s work has been part of the AGO collection for over 75 years. 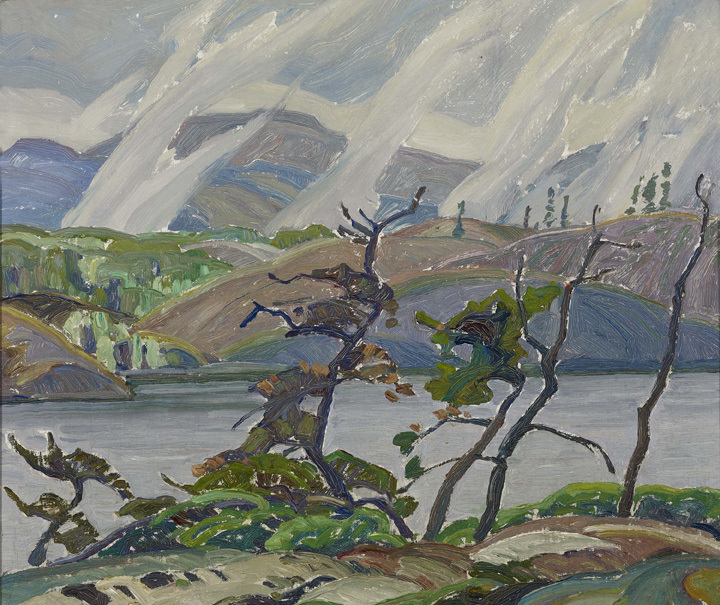 Several of Lismer’s most accomplished works are currently on display in the Thomson Collection galleries at the AGO. Q1. 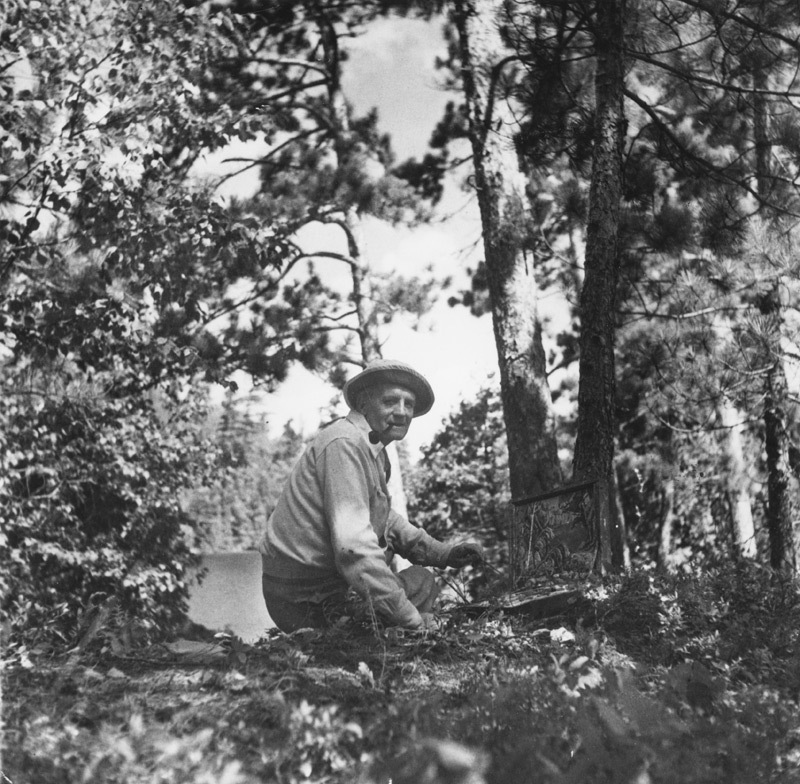 Arthur Lismer believed that art should be part of “everyday life”. What does this mean to you? What examples can you think of that would support the idea of “art in everyday life”? Does your version include the making of art, or the enjoyment, contemplation, and discussion of art and the ideas communicated? Explain. Q2. Using your journal, sketchbook, camera, or smartphone, record your efforts to explore art in your everyday life. Commit to doing this over a period of time, be it an hour, day, week, or month. Everything is permissible – art making – discussions – reflections – exploration of artists’ lives – or simply looking at everyday objects as “art”. 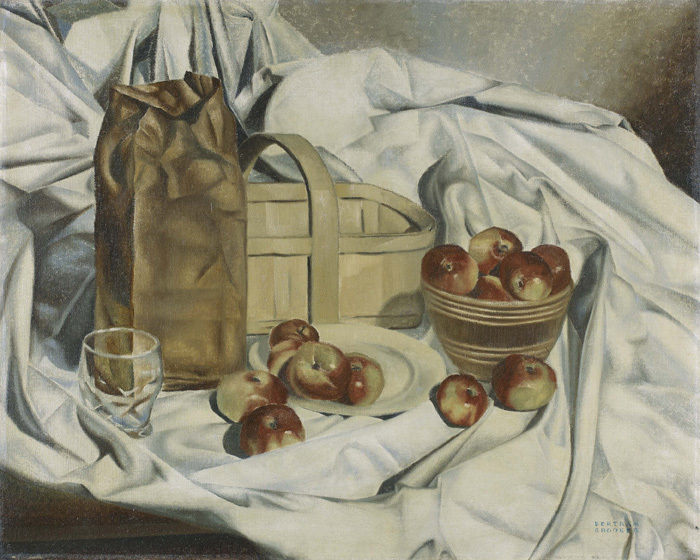 Share your week of “artistic living” with the class using a presentation format of choice. Lismer Bridges, M. (1977). A border of beauty – Arthur Lismer’s pen and pencil. Toronto. Red Rock. Reid, D. (2010). 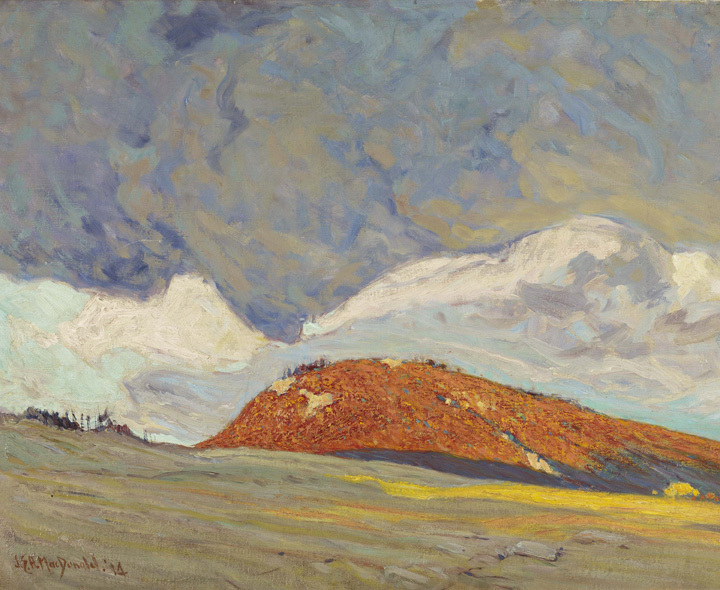 The group of seven project 1920-2005. Toronto, ON: Ontario Association of Art Galleries.